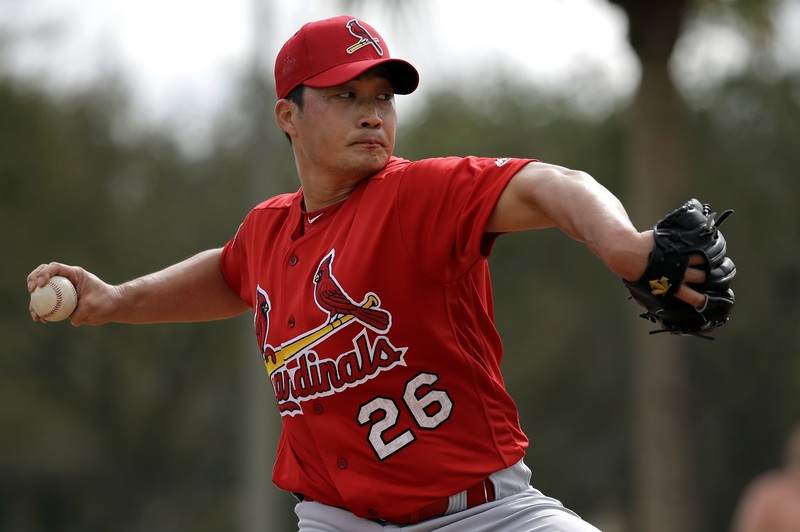 St. Louis Cardinals’ Korean reliever Oh Seung-hwan fanned Minnesota Twins’ streaking Korean slugger Park Byung-ho to register his first strikeout in the Major League preseason games. The 33-year-old right-hander made his fourth appearance in Grapefruit League action Monday against the Twin in Florida, and continued his impressive ways. He entered the game as the third pitcher for the Cardinals with his team down 2-1, and retired three batters in order, including striking out his country man Park, to extend his hitless streak. Oh has allowed just one runner, by hit-by-pitch, over 4 1/3 innings so far, and he now has a strikeout. Park struck out against Cardinals’ starter Mike Leake in his first at-bat also, but hit a line-drive single to center in the fifth against Seth Maness to extend his spring hitting streak to six games. His spring batting average, however, actually dropped to .360, which had gone up all the way to .364 after his second two-hit performance in three games on Sunday. The 29-year-old first baseman/designated hitter leads the Twins in hits (9), runs (5), home runs (3), runs-batted-in (7) and strikeouts (8). The Twins went on to win 5-3 to improve to 7-6 and the Cardinals fell to 7-5. Baltimore Orioles Korean outfielder Kim Hyun-soo was given a day off after getting a hit for the third straight game on Sunday.